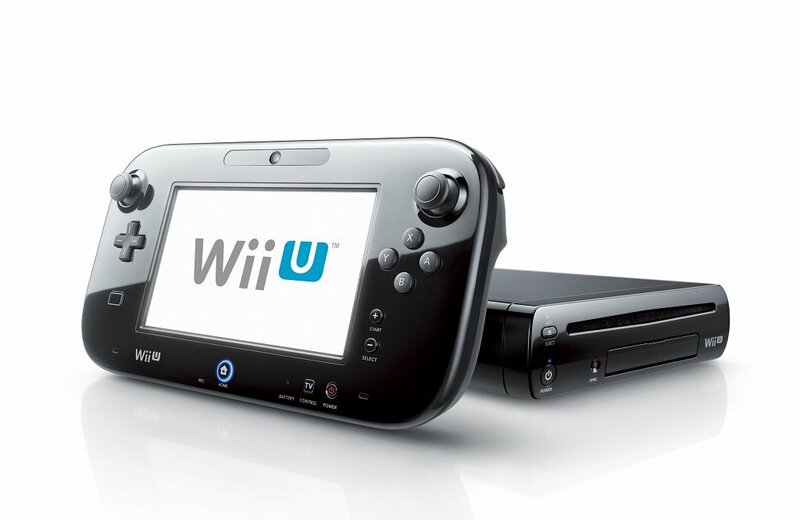 When Nintendo released the Wii U in 2012, the premiere launch title was Nintendo Land. Nintendo Land looked to do for the Wii U what Wii Sports did for the original Wii. Featuring simplified versions of iconic Nintendo franchises, Nintendo Land was aiming to bridge the gap between the more casual audience brought in through the Wii, and more experienced Nintendo veterans. Nintendo Land may not have ended up being the phenomenal success that Wii Sports was, but it is a whole lot of fun. Provided you can get a full group of players to join in with you. The game has a simple setup. Players take control of their Miis, and traverse the titular Nintendo Land, a kind of theme park based around Nintendo, with the “attractions” serving as various mini-games inspired by popular Nintendo franchises. The hub world itself is a thing of simple beauty. You can win prizes to decorate Nintendo Land to give it some added flair, and Miis from all over the world litter the place, giving you some insight to their high scores and showing off their Miiverse posts. The hub connects the twelve different attractions, six of which are intended for solo players, three are multiplayer exclusives, and three that can be enjoyed by one’s self or in competitive and cooperative multiplayer. Not every attraction is equal in quality, but they all showcase different gameplay and visual styles. The single player games include Balloon Trip Breeze, Captain Falcon’s Twister Race, Donkey Kong’s Crash Course, Octopus Dance, Takamura’s Ninja Castle and Yoshi’s Fruit Cart. 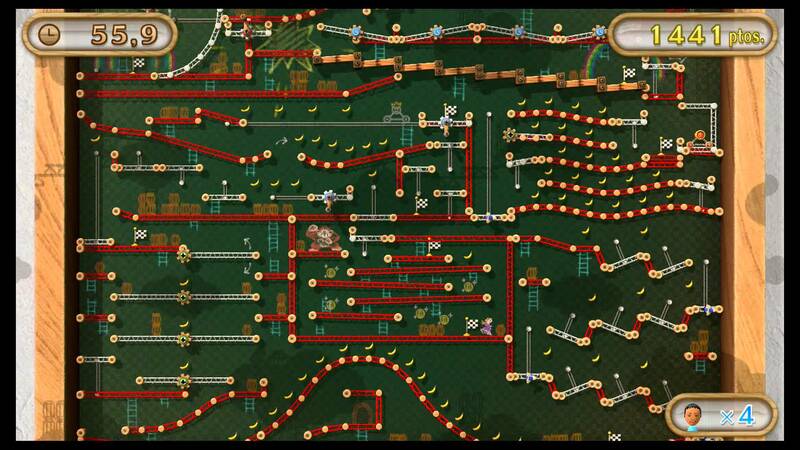 Donkey Kong’s Crash course is the best of the single-player lot, and – fittingly enough for the DK series – is also the most difficult game in Nintendo Land. Crash Course sees players titling the Wii U Gamepad to move a small trolly through extravagant obstacle courses inspired by the original Donkey Kong arcade game, with even the slightest bump or fall destroying the trolly. Captain falcon’s Twister Race is a simple but fun racer where players use the Gamepad’s motion controls to steer their vehicle, with the Gamepad screen providing an aerial view of the track and the TV giving a third-person view of your vehicle. Yoshi’s Fruit Cart is a clever display of the Gamepad and TV, as players must draw a path for a Yoshi cart to gather all of the fruit that appears on a stage. The fruit is only visible on the TV screen, so players must use it for reference when drawing on the Gamepad. Octopus Dance (based on the Game & Watch title ‘Octopus’) is a pretty uneventful music rhythm game in which players use both the control stick and motion controls to memorize and mimmic dance moves. Balloon Trip Breeze has the player’s Mii flying through the air with balloons on his back, with the player using the Gamepad’s touch screen to create gusts of wind to help the Mii travel from one island to the next and avoid obstacle. The Gamepad gives an up-close look at the player, while the TV provides a more zoomed out view of the stage. Takamura’s Ninja Castle is one of the more simple, but one of the more fun, single-player offerings. 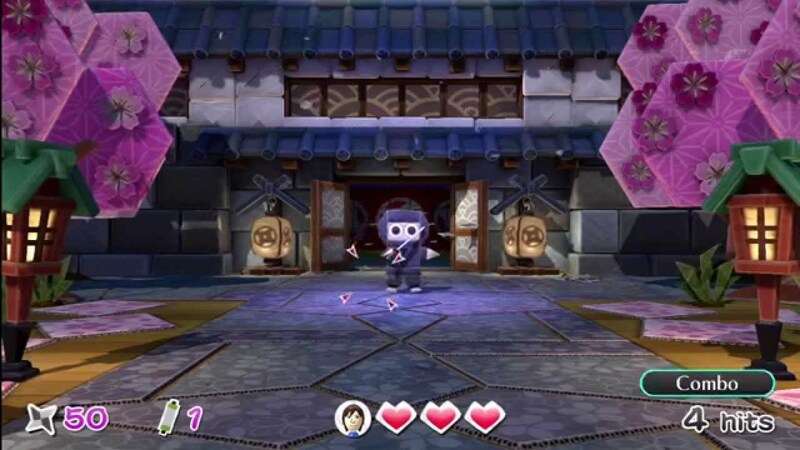 Ninja Castle sees players holding the Gamepad on its side, and swiping the touchscreen to throw shurikens at enemy ninjas. The solo attractions of Nintendo Land provide their own sense of fun, but their overall appeal is short-lived when compared to their multiplayer brethren. 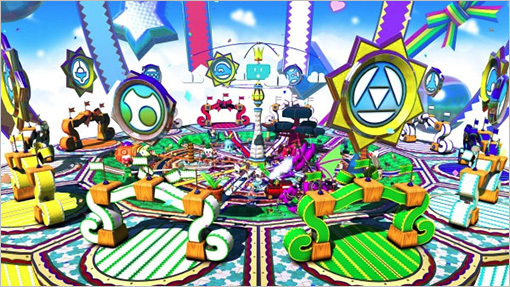 The competitive attractions are among the most fun in the entire package, and include Mario Chase, Luigi’s Ghost Mansion and Animal Crossing: Sweet Day. 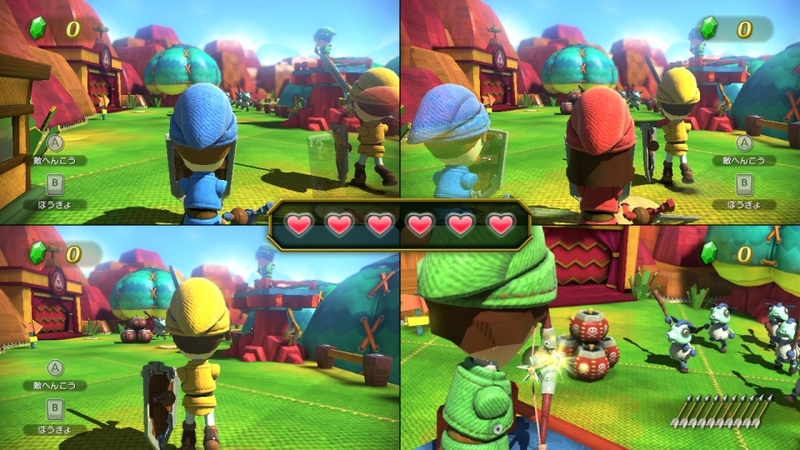 All three of which use a similar concept of one player using the Gamepad while the others use Wii remotes in a game of chase. But they are each done with a different take on the concept, giving all three games distinct personalities. In Mario Chase, the Wii remote players all take on the roles of Toad-dressed Miis, and they rush through a Mushroom Kingdom-inspired obstacle course to catch the Mario-clad Gamepad player. Although seemingly at a disadvantage, the Gamepad user can see an overhead view of the entire arena and the Toad players’ locations on the touchscreen, while said Toad players have to rely on what’s visible on their third-person view on the TV. 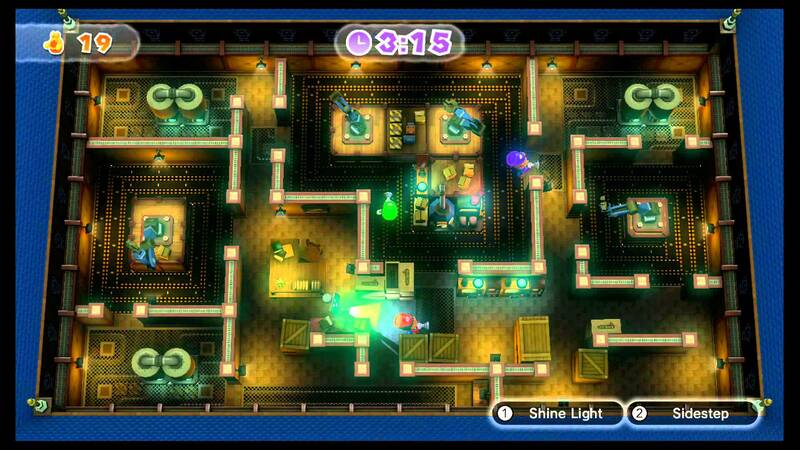 Luigi’s Ghost Mansion has up to four players taking on the roles of Ghost Trackers, while the Gamepad player is a ghost. The action all takes place from a bird-eye view on a single screen, but the ghost is only visible on the Gamepad’s screen. 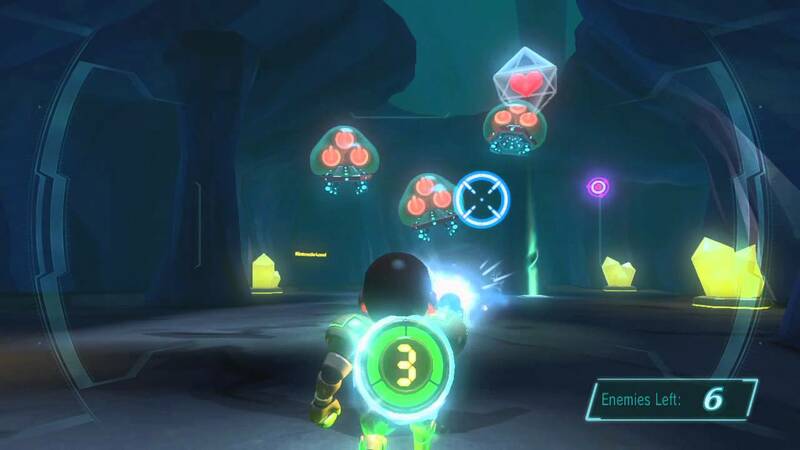 The ghost player must sneak up and ambush the Ghost Trackers, while the Trackers must shine their flashlights on the ghost to deplete its health and defeat it. The trackers are made aware of the ghost’s presence through vibrations on the Wii remote, and they can revive their fallen comrades with their flashlights. This title provides a great multiplayer experience with good balance between the opposing teams. Animal Crossing: Sweet Day is just as much fun, with four players taking control of animals who must gather candy from trees while avoiding being caught by two guards (both of which are controlled by the Gamepad’s two control sticks). The more candy the animals have the better their score. But more candy also means slower movements, making them easy pray for the town guards. These three titles provide some of the most enjoyment in Nintendo Land, but they come at a price. These games are exclusively multiplayer, and require a group of five players to enjoy them to their fullest. Nintendo Land doesn’t feature any online capabilities, which means many people will rarely get the chance to get the most out of these three titles. As fun as these games are, they lose a whole lot of their appeal without the full group. It is the team attractions, however, that provide Nintendo Land’s deepest experiences. The Legend of Zelda: Battle Quest, Metroid Blast and Pikmin Adventure, while bearing uninspired names, feel like condensed but complete games in their own right. In The Legend of Zelda: Battle Quest, three players can take control of sword-weilding Links, while the fourth uses the Gamepad and is armed with a bow and arrows. The Links all venture through a makeshift Hyrule, where they fight waves of enemies and solve small puzzles while on a fixed path. You even come face-to-face with boss encounters. Metroid Blast -the biggest game in Nintendo Land – sees up to four players controlling Samus-like characters on foot, while the Gamepad user controls a gunship. Metroid Blast can be played in modes that pits the on-foot players against the gunship, a free-for-all where players scramble for tokens, and a more extravagant (though traditional) mode where all players work together to take out enemies and boss monsters. Pikmin Adventure has one player controlling Olimar with the Gamepad, who in turn commands small armies of tiny Pikmin, while the other players take on the roles of larger Pikmin. It’s a simple game where players must overcome enemies and obstacles and defeat the end-level boss to move on. Pikmin Adventure also includes a versus mode. The team games will probably be the ones that have you coming back to Nintendo Land, considering they work well with a solo player or with multiple players, without suffering from a lack of a full group. They also boast a surprising amount of gameplay depth. As a whole, Nintendo Land is a winning collection of mini-games that has a lot more heft than Wii Sports ever did, and it remains one of the best showcases of the Wii U hardware. It includes wonderful art styles (fabric Hyrule for Battle Quest, clockwork creatures for Pikmin Adventure, origami ninja’s in Ninja Castle, etc.) and the remixes of classic Nintendo tunes, while not as extravagant as those in Smash Bros. are nonetheless delightful. On the downside, not every game in Nintendo Land is a blast, with the likes of Octopus Dance and Captain Falcon’s Twister Race teetering on forgettable. Others, such as Yoshi’s Fruit Cart, are novel, but feel more like tech demos than anything. The multiplayer exclusive games feel incomplete unless you have a full party, and the lack of online multiplayer only magnifies these shortcomings. With that said, if you and your friends can all get together for a few rounds of Luigi’s Ghost Mansion or Metroid Blast, then you have one of Nintendo’s very best party games at your disposal with Nintendo Land.